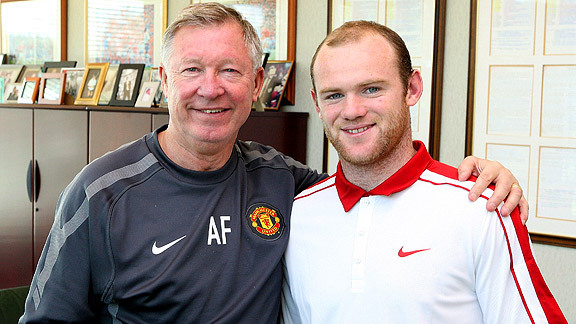 John Peters/Man Utd/Getty Images Wayne Rooney poses with Alex Ferguson after signing a new five-year contract with the club. Well, I guess we can now add Wayne Rooney to that elite list of Hamlet-like athletes -- LeBron, A-Rod, Brett Favre -- who toy with fans' emotions while they try to negotiate the best deal. And to think I could have spared myself the whole tedious melodrama had I only taken Wayne at his word four years ago when I was introduced to him at the launch for his memoir. I was the U.S. editor for his book. "You're a Gooner, huh?" Rooney said. "Couldn't they find a United fan to edit my book?" "Admit it," I said, "you'd love to play for Arsenal." Rooney let out a big Shrek-like laugh. "I love playing for Manchester United," he said. "I can't imagine ever playing anywhere else." Of course, this is the same guy who famously pledged his lifetime fealty to Everton -- "Once a Blue, Always a Blue" -- before his agent Paul Stretford ripped out the Toffees' heart by moving his meal ticket to Manchester United in 2004. Now the former vacuum cleaner has done it again, sucking up another million dollar commission by negotiating a new five-year contract for Rooney worth a reported 180,000 pounds a week. So ends Rooney's version of "Indecision: 2010," even though, unlike LeBron, he didn't get his own TV special, just a significant deposit in the Hate Wayne account from his City friends across town with whom he had been playing footsie all week. After a masked mob of sociopathic United fans made death threats to Rooney on Thursday if he left the club for their crosstown rival, it's now Man City's turn to wield the pitchforks and try to impale Master Wayne on them. Can you imagine the civil war that will erupt when United travel to Eastlands on Nov. 10? In the end, even Stretford wasn't craven enough to deal Rooney to City. And despite all the brinkmanship and bluster, he didn't really have any viable options elsewhere. Spain? It's hard enough to imagine Wayne Rooney being transplanted to the South of England, let alone a country with a different language and culture. Compared to him, David Beckham was a boulevardier, and though Goldenballs never mastered Spanish, his smooth charm allowed him to enjoy the food and way of life in Madrid. Could you imagine Rooney sitting in a tapas bar, engaging in easy banter with a waiter about which Rioja goes with the paella? 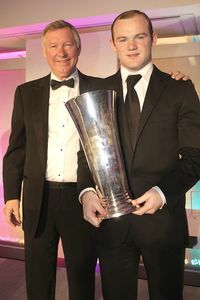 John Peters/Getty Images Better Days: Rooney, with Ferguson, is presented with the Player of the Year trophy in May. As much as Jose Mourinho is known to admire Rooney, he'd have been a fool to add him to his collection of marquee names. Real is playing excellent soccer at the moment and is perched atop La Liga. Besides, who would The Special One have dropped to make room for El Wayne? Add to that Mourinho's bromance with Sir Alex Ferguson and his stated desire to be SAF's successor, and the odds are pretty small that Stretford had Real Madrid on speed dial. Barca was an even less likely destination. The club's finances are as shaky as a Chilean mine shaft, and management is still smarting from its Zlatan Ibrahimovic experiment. No reason to get suckered a second time. I suppose heading to Italy was a possibility -- and Coleen Rooney might have gotten some measure of payback by dropping a small fortune in the Milan boutiques -- but even in his most mercenary guise, I just couldn't see Rooney playing for Inter Milan under Rafa Benitez, the former manager of Liverpool, a club he poured Haterade on at both Everton and United. AC Milan could have afforded him, but with Robinho and Ibrahimovic, why would they need him? For more from David Hirshey, check out his columns on all things soccer. • Time to dethrone King Kenny Dalglish? • Is Newcastle for real? Which brings us back to where we started -- England. I'm sure Roman Abramovich would have loved nothing more than for Chelsea to salt the earth of Old Trafford by buying its star player, but could you really picture Rooney and Didier Drogba playing together? So in a way, it makes perfect sense that Rooney would return to Sir Alex's bosom, where his talent will continue to be nurtured and his peccadilloes tolerated as long as he starts performing again to his old world-class standards. Sure, it will take some fence-building with the Old Trafford faithful, but if Rooney can help bring home some hardware, all will be forgiven and this unsavory episode will be buried alongside the photos of him smoking and urinating in the street. As A-Rod learned with the Yankees last season, if you can give the fans what they want -- a championship -- it will all have been worth it. David Hirshey has been covering soccer for more than 30 years and has written about the sport for The New York Times, Time, ESPN The Magazine and Deadspin. He is the co-author of "The ESPN World Cup Companion" and played himself (almost convincingly) in the acclaimed soccer documentary "Once in a Lifetime."